Receive training in order to obtain your PA State Inspection certifications in auto/light truck, heavy truck/trailer, and emissions. Prepare for a future in the diesel powered Industry, whether it is medium or heavy duty trucks, tractor, or construction equipment. 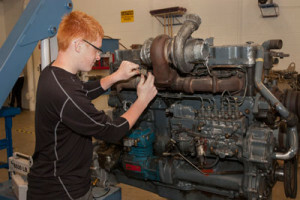 Develop the skills necessary to obtain knowledge to perform on- and off-vehicle repairs needed in the diesel repair Industry. Utilize computers in the shop to diagnose problems on vehicles and how to repair them. Being a lifelong learner has allowed me to become a Master Mechanic on any engine, big or small. Throughout my life I have strived to learn as much about the theory and operations of all engine types. 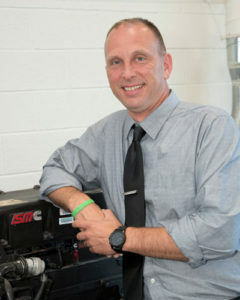 During high school, I attended the Automotive/Diesel Technology course at Berks Vo-Tech East and graduated from Automotive Technology Advanced Class III. After a few years working in the field, I enlisted in the United States Marine Corps. There I was an I-Level Technician for the T-400 Huey and T-700 Cobra Turbo-Shaft engines. This led to being a Test Cell Operator. After my tour of duty I went back into the diesel field. I then was given an opportunity to teach at RMCTC for two years as the Motorcycle, Marine and Small Engine instructor before returning to the diesel field for the past twelve years. I enjoy sharing the knowledge and work ethic I have learned throughout my career as a technician and a marine. Altogether, I have more than 20 years of experience in the diesel technology field. Diesel and turbo-shaft engine technician experience of more than 20 years.